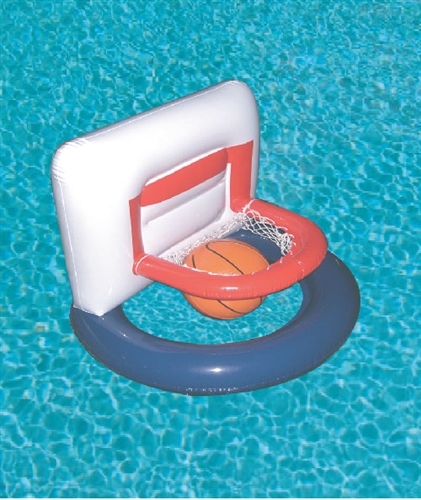 We use nontoxic plastic soft PVC material to create specialty items, like Inflatable Basketball Game Set to play basketball in pool, totally free of sharp corners nor metal support pieces, Inflatable rubber duck as well as inflatable jet ski, inflatable pool tray, and head rest pillows used in spa and pool, etc.. Here creativity is focused and emphysized. Safe swimming pool toy, met and exceeded Product Safety Regulations CPSIA and California Proposition 65. PVC Inflatable Rubber Duck, size 24” after inflation, for pool fun. Safe toy. 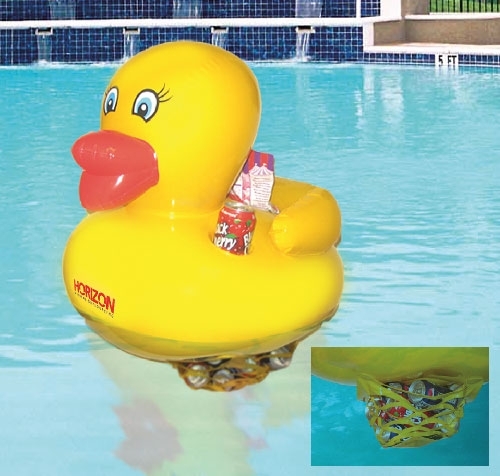 A fun and creative PVC inflatable rubber duck designed and made for pool fun device. It comes with net underneath to keep unopened soft drink cans cool under water. Back of duck has 4 can holders as well as one 10” tray to hold other personal belongings. Safe toy made of nontoxic PVC free of all heavy metals as well as all 7 chemical Phthalates, met CPSIA and California proposition 65 Product Safety Regulations. Unit price includes one color one place running charge. PVC Inflatable basketball game set, size 24” after inflation, for pool fun. Safe toy. A fun and creative PVC inflatable basketball game set, designed and made for pool fun sports basketball game, free of shark corners. It comes with 3 water chambers to hold water for stabilizing the basketball game hoop underneath the base ring. Safe toy made of nontoxic PVC free of all heavy metals as well as all 7 chemical Phthalates, met CPSIA and California proposition 65 Product Safety Regulations.